THE PICKIEST EATER IN THE WORLD: BROOKLYN'S NEW YORK PIZZA: A NEW NAME IN PIZZA! Brooklyn's New York Pizza is one of the fastest rising Pizza Chains in the country today. 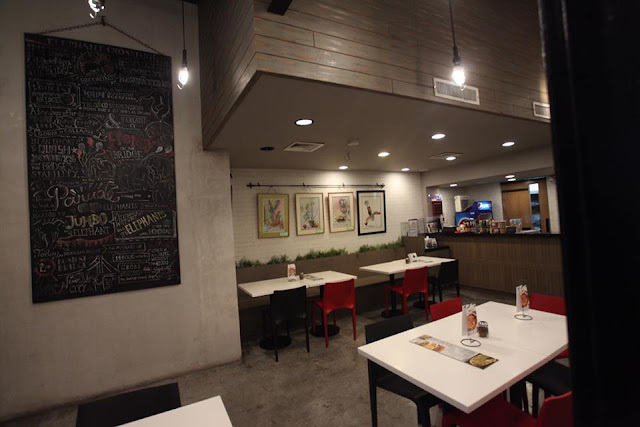 Coming seemingly out of nowhere, Brooklyn's now has a total of seven branches scattered around Metro Manila, ranging from places such as Tomas Morato, Robinsons Manila, and all the way to Alabang. The place has the casual cool, relaxed vibe that you'd expect from a U.S. Pizzeria, but at the same time, has the welcoming warmth that we Pinoys are known for. We began with the Brooklyn's Buffalo Wings (P298), and I was actually quite amused with how it was listed among the entrees, instead of as a starter. However, with its tangy Buffalo sauce, it makes perfect sense for Pinoys to want to eat these bad boys with loads of rice! If the acid is a bit too much for you, you can add P25 for Ranch Dressing, which helps balances the flavors out. Pesto and Tinapa may sound like a rather unorthodox pairing, but The Pesto By The Bay (Solo P159/Super Size P225) pasta manages to fuse those two contrasting flavors harmoniously. Made with Brooklyn's Homemade Pesto Sauce, and speckled with bits of Shredded Smoked Fish, the smokiness of the fish, compliments the fragrant notes of the Pesto Sauce. A harmonious fusion of Pinoy and Italian flavors! I'll be honest with you. I dropped by Brooklyn's Pizza not to eat, but to pick up something from my other blogger friend who attended the event. As I was waiting for him, they brought out the The Patriot (P328). And THAT was the exact moment that I decided to stay. The Patriot is comprised of Three Types of Longanisa: Recado, Hamonado, Batutay, and served with Garlic Rice topped with two egg, cooked to your liking. Yes, I'm a breakfast food junkie, which is why I was so easily swayed.. But the fact is, these were really awesome pieces of Longaniza. with my favorite being the sweet Hamonado, with the edges toasted to a gorgeous caramelization. For the pizzas, we were first given a taste of their Cheese Pizza (Manhattan 10" P246/ Queens 14" P405/ Brooklyn 18" P630), which is the base of many of their pizza variants. An aromatic tomato sauce is smeared over a pie crust, and topped with Mozzarella and Parmesan Cheese, then baked to golden perfection. A simple classic, done right. Being called "Brooklyn's Pizza" doesn't mean they can't draw inspiration from local flavors, in fact, one pizza in their menu actually pays tribute to it. The La Filipizza (P308) brings together some beloved Filipino comfort foods, such as the Longanisa with Tomato and Salted Egg, and given the pizza treatment by laying out on a gorgeous pie crust, and topped with Mozzarella before being baked in Brooklyn's ovens. The ultimate fusion of Pinoy and Western Flavors, all in a delicious pizza! I'm one of the very few people that hasn't gotten bitten by the Pokemon Go Craze, however you can't help but appreciate the creativity that went into the conceptualization of Brooklyn's Pokeball Pizza! Made with Half-Pepperoni and Half - White Pizza, and given more definition with Olives, which actually adds a depth of flavor to the pizza, The Pokeball Pizza has instantly become a popular dish for the kids and kids at heart! Brooklyn's New York Pizza brings together the best flavors of the West, together with tailored dishes made with the Pinoy Palate taken to heart. Brooklyn's recently opened a branch at in Madison Galeries Lifestyle Mall, at Alabang Hills, and expect to see more of them in the future!